Within 15 minutes of leaving Nawiliwili Small Boat Harbor, Lahela Ocean Adventures has you in ocean waters deep enough for big game fishing. 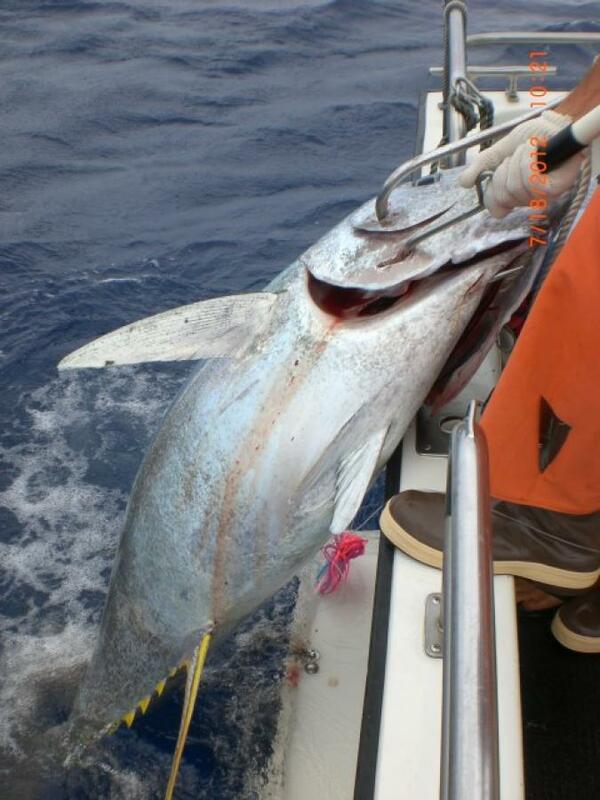 The 500 to 1000-fathom drop is where you’ll find Kauai’s big blue marlin and ahi — weighing in at more than 100 pounds. July 17, 2009 - 560 lb. You won’t find fishing like this on the east coast. There it can take you 3-4 hours just to reach the right depth to find your catch! Aboard the Lahela, you’ll troll the Pacific Ocean using live bait or artificial lures (the captain guides you in deciding what’s best) in an attempt to raise a trophy sized marlin. 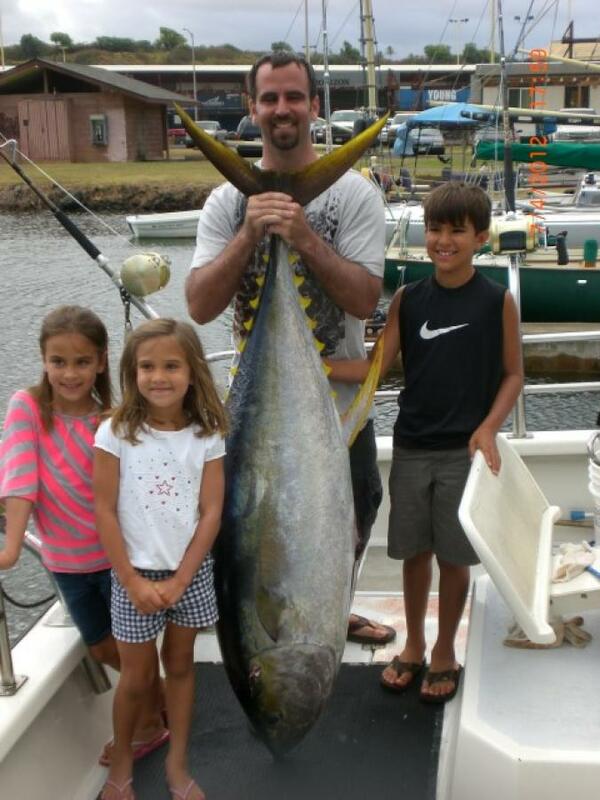 Kauai provides some of the best deep sea, big game fishing anywhere. 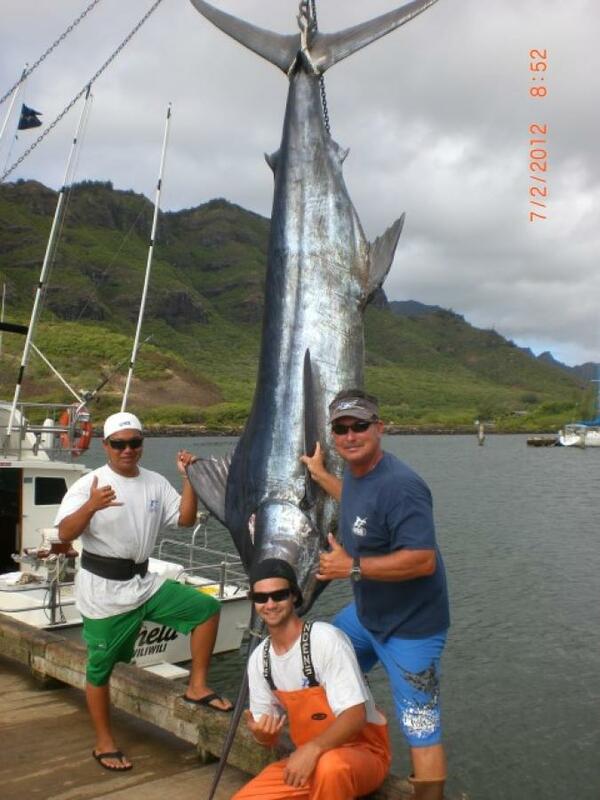 Marlin fishing can be done year round, whether you’re an experienced angler or a novice. It’s an experience the whole family will love. Lahela Ocean Adventures has the only U.S. Coast Guard Certified Sport fishing game boat on Kaua’i that can legally carry more then 6 passengers up to 14 passengers on all of our private charters. Prices do not include taxes, harbor fees or gratuities for crew members. 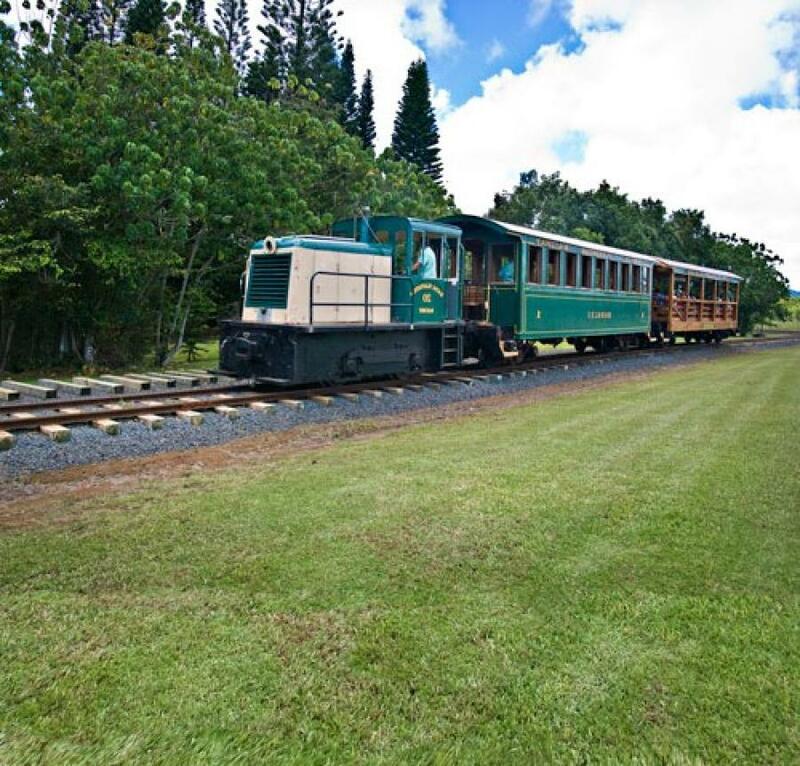 For more than 6 passengers please contact us for our current rates. Includes: All your bait & tackle, expert instruction, bottled water and soft drinks. 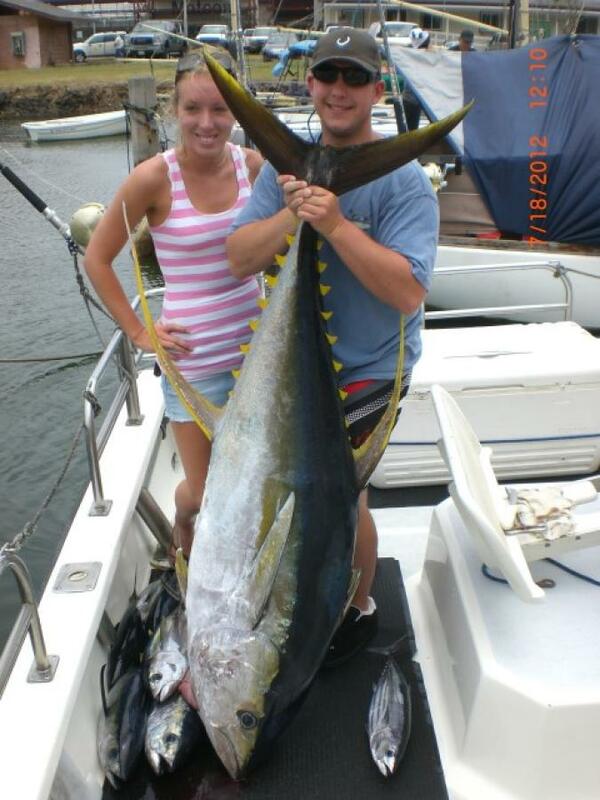 Deluxe Shared Charters: Each departure requires a minimum number of anglers. Three anglers on the 4 hour and 4 anglers for both the 6 & 8 hour. Economy Shared Charters: Each departure requires a minimum number of 4 anglers. 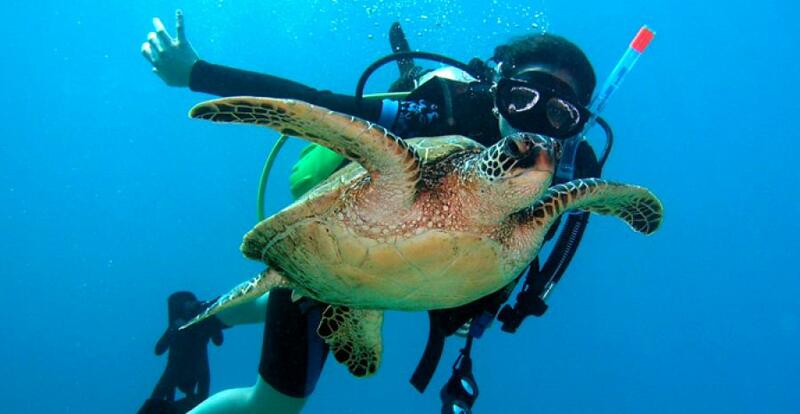 Minimum age requirement for both the deluxe and economy shared charters is 7 yrs. old. Not recommended for pregnant women, and anyone with a history of health, heart or back problems. 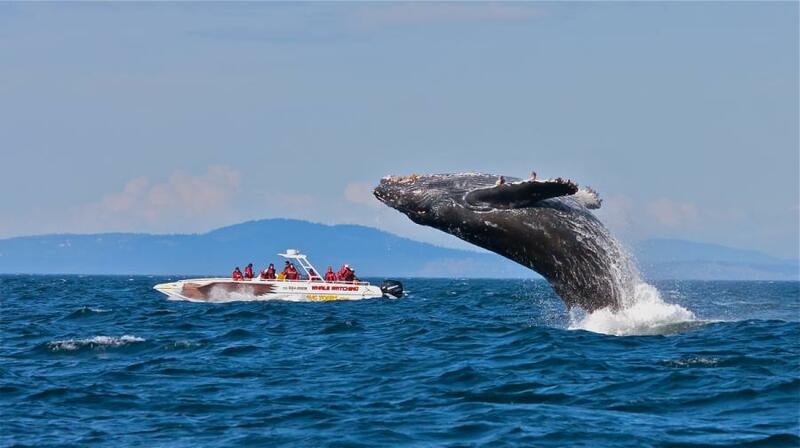 Rates are per-person and do not include taxes, harbor fees or any gratuities for crew members.